[The deal] was nothing less than a humiliation of a small and suffering member state, a sadistic display of naked financial power. Do as we say or we will “collapse your banks,” Eurogroup Chairman Jeroen Dijsselbloem had apparently told Greek negotiators earlier. In the climactic weekend it emerged that he wasn’t bluffing. Despite the fact that the ‘No’ vote had scored a resounding victory in a national referendum a week earlier, Greek Prime Minister Alexis Tsipras decided he had no choice but to surrender to all the creditors’ demands, but in the end it turned out that even unconditional surrender was not enough. Germany’s implacable finance minister, Wolfgang Schäuble, saw weakness in his opponent and went for the jugular. He insisted on “guarantees” that Greece would keep its word, including sequestration of Greek assets in a fund under his control. 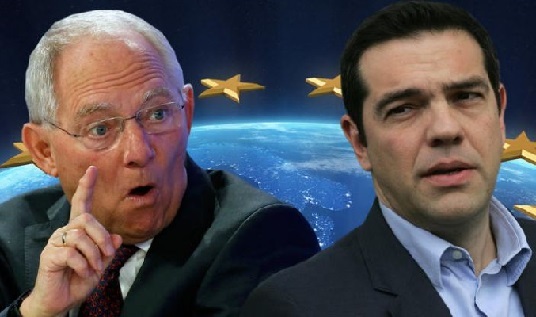 No such guarantees had been demanded previously, but now Chancellor Angela Merkel, who had previously seemed less exigent than Schäuble, declared that Greece had forfeited the “trust” of its European partners. In the end she proved to be a good German but not a good European. Wolfgang Münchau has an awesome FT tribune today, “Greece’s brutal creditors have demolished the eurozone project.” No money quotes, as the whole piece is one. Just read it. All of it. It’s strange to think that, back when I was a teenager, the European project still seemed like the kind of thing to which one might nobly devote one’s life. But the European dream is dead—not just because of Greece, but because of the depth of nationalism the euro crisis has revealed, and the ugly hatred it has incited. The best we can now hope for is an orderly slimming of the EU to its key achievements: free movement of people, coordination on the most important regulations, etc. (I deliberately exclude political values: as the case of Hungary shows, the EU is incapable of safeguarding those in any case.) But the centrifugal forces, and the strength of the populists, will be such in the next years that we may wind up losing even that. Again, the posture of Germany and its little country allies may have killed the European idea. As for big country France, I shudder in anticipation of the coming public opinions polls on attitudes toward Europe. Revulsion is all but guaranteed. And in polls outre-Manche, Brexit will no doubt leap. It’s now beyond doubt that the euro has been “a curse,” as retired longtime Christ Church, Oxford, economics professor Peter Oppenheimer asserted recently. N.B. the euro, not Europe; not the European idea. The problem is not the Treaty of Rome or even the Single European Act; it’s Article 109 of the Maastricht Treaty, and all that ensued from that. The Telegraph’s Ambrose Evans-Pritchard, in a comment entitled “Greek deal poisons Europe as backlash mounts against ‘neo-colonial servitude’,” weighs in on the deal. E.g. 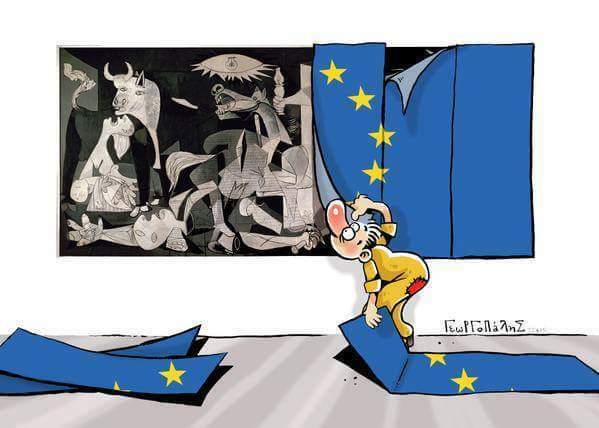 “Greece has been devastated and humiliated. Europe has showed itself Pharisaical, incapable of leadership and solidarity,” said Romano Prodi, the former Italian prime minister. An independent fund will take control of €50bn of Greek state assets, collateral to prevent Syriza reneging on the deal at a later date. Three-quarters of this will be sued to recapitalise the Greek banks and repay debt. International inspectors will have the power to veto legislation. The radical-Left Syriza government will be forced to repeal a raft of laws passed since it took power in January, stripping away the last fig leaf of sovereignty. “It is unconditional surrender. We get serious austerity with no debt relief. 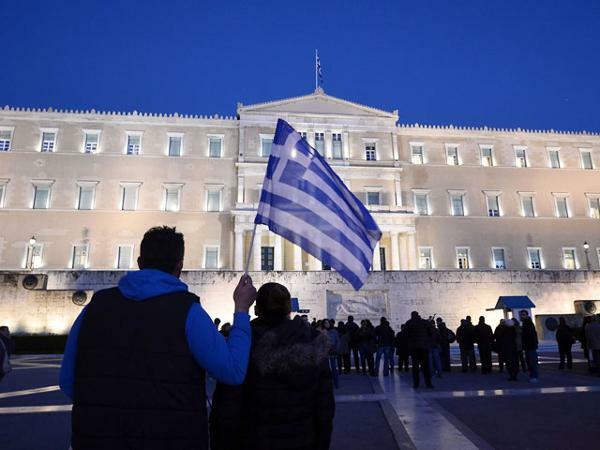 We will have foreign supervisors crawling over everything,” said Costas Lapavitsas, a Syriza MP and one of 40 or so rebels who plan to abstain or vote against the deal, mostly from the Left Platform. In the plan is a provision for ending laws against Sunday trading. Rhetorical question: What does having stores open on Sundays have to do with economic growth and/or reimbursing national debt? Concrete question: Are stores in Germany open on Sunday? Answer here. Ambrose Evans-Pritchard of London’s Daily Telegraph has therefore asked whether we are right to focus on Greece at all. Evans-Pritchard is a conservative writer whose well-informed essays on European finance are a bracing contrast to the conservative sloganeers in the United States, who often write as if the virtuous party in any dispute were always the one with the most money. “The currency union itself is delinquent,” Evans-Pritchard asserts. He is right. Greeks could borrow what they did because they were now members of a rich family. If Brad Rockefeller walks into a casino in a soiled T-shirt and runs up a million-dollar debt that neither he nor his family will repay, what was the casino’s mistake? Trusting some T-shirt-wearing guy or trusting the Rockefellers? I’ve been ranting here but so be it. I’m really quite dismayed and dejected about all this. Que diraient [les] entichés de Tsipras si François Hollande, David Cameron ou Angela Merkel organisaient un référendum en moins d’une semaine sur la question européenne, sans campagne et sans question connue dès l’origine ? Ils protesteraient de ce que l’on méprise le peuple français. Ils dénonceraient le populisme de l’affaire. Et ils auraient bien raison. UPDATE: Here are Stathis Kalyvas’s “18 tweets on the Greek referendum of July 5, 2015” following the announcement of the ‘Oxi’ victory. Paul Krugman (of course), “Ending Greece’s bleeding.” Can hardly disagree with The Man here. Romaric Godin (of the Paris business daily La Tribune), “Grèce: le ‘non’ grec place Angela Merkel au pied du mur.” This one is quite good. An interview with Thomas Piketty in Die Zeit, dated June 27th, and translated into English, in which he tells the Germans a few home truths about their own history when it comes to repaying—or not repaying—debt. Piketty is great here. A total must-read. 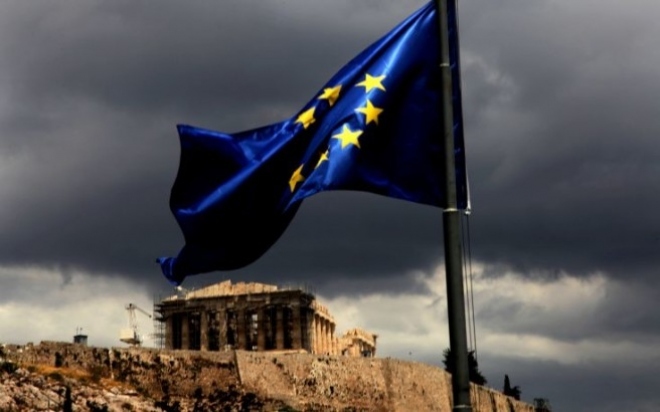 If European leaders were thinking clearly, they should see that rather than punishing Greece, it is now in the EU’s interests to do its level best to make sure that Greece can leave the euro, but stay inside the EU with a minimum of pain. If that means giving Greece debt relief as part of the exit package, so be it. 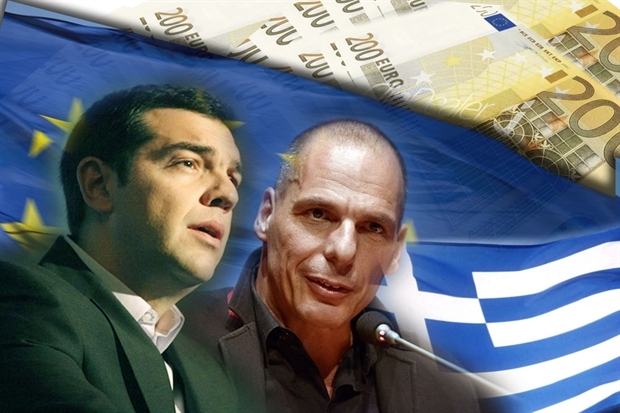 Debt relief, in return for Grexit, could make political as well as economic sense. 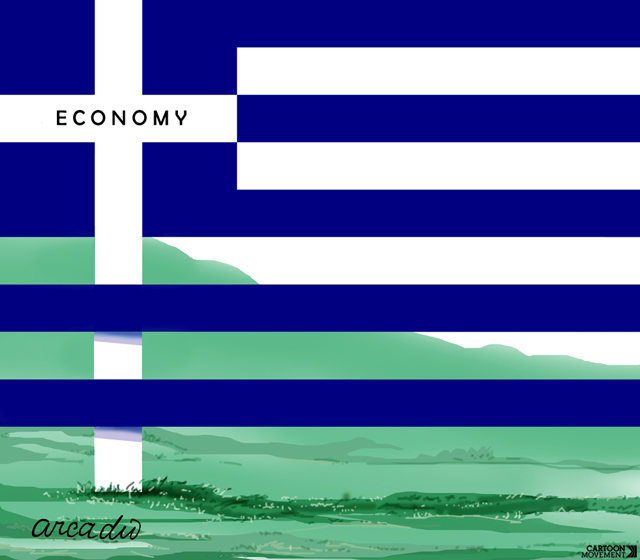 Even so, restoring the drachma in Greece without provoking an even more intense economic crisis will be very difficult. But, if it could be done, the EU may finally have a model for liberating other European nations from a malfunctioning euro. A nice post by Matthew Yglesias in Vox, “Greek crisis: 11 people and institutions to blame,” i.e. just about everybody. I particularly like nºs 8, 9, and 11. Daniel Cohn-Bendit was the guest on France Inter this morning, with Greece the sole subject (here and here). Entre autres, Dany called for a mediator in the negotiations between Greece and the Eurogroup. Mark Blyth, the Eastman Professor of Political Economy at Brown University, has a piece in Foreign Affairs on “A pain in the Athens: Why Greece isn’t to blame for the crisis.” So what are roots of the crisis? Answer: they’re far away from Greece and lie in the architecture of European banking. And the Project Syndicate website has a piece, equally short, by Harvard University economics prof—and former Venezuelan minister of planning (1992-93)—Ricardo Hausmann, “Austerity is not Greece’s problem,” in which he makes observations on the Greek economy that I’ve been making since the crisis began six years ago.